Houghton Mifflin Harcourt, 9781328771476, 304pp. Jonathan and Drew Scott, known for their wildly popular HGTV shows including Property Brothers and Brother vs Brother, follow up their New York Times bestseller, Dream Home, with a highly anticipated memoir. 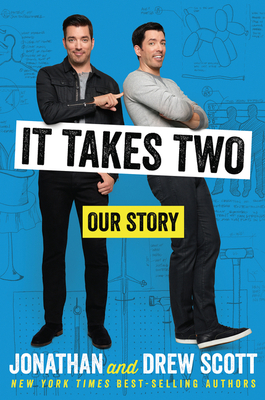 It Takes Two: Our Story shares never-before-revealed tales of the brothers’ childhood and rise to fame—from starting their first business at 7 years old, their years modeling and acting, to their first house purchase at the impressive young age of eighteen. They soon found their true passion in life, combining their natural gifts for entertaining with the skills they learned from buying, renovating, and selling homes. Complete with hilarious behind-the-scenes stories from set, Jonathan and Drew discuss how their family and upbringing have led to their success in life. Throughout, the brothers keep fans laughing with the clever—and sometimes zany—sibling banter for which they’re known best. JONATHAN SCOTT, a renowned designer, and DREW SCOTT, a seasoned realtor, star in HGTV’s Property Brothers, Buying & Selling, and Brother vs. Brother. They have worked in real estate for over 15 years. They founded Scott Brothers Entertainment. DREW SCOTT, a seasoned realtor, and JONATHAN SCOTT, a renowned designer, star in HGTV’s Property Brothers, Buying & Selling, and Brother vs. Brother. They have worked in real estate for over 15 years. They founded Scott Brothers Entertainment.